From the Division of Clinical Neurosciences (M.H.M., M.P., V.K. ), Department of Clinical Genetics (M.H. ), and Turku PET Centre (V.K. ), University of Turku and Turku University Hospital, Turku, Finland. Objective: To describe the clinical features and brain imaging findings of autosomal dominant Parkinson disease (PD) associated with a recently reported mutation in SNCA. Methods: A Finnish family with PD in 3 successive generations, in accordance with an autosomal dominant inheritance pattern, was identified. We examined 2 available members of the family, the female proband and her daughter (both with early-onset PD), clinically and using dopamine transporter imaging ([123I]FP-CIT SPECT). A possible causative genetic defect was investigated by molecular genetic analyses. Results: A heterozygous c.158C>A (p.A53E) point mutation in SNCA was revealed in both patients. The patients presented with PD clinically characterized by severe bradykinesia but with very little tremor and early onset of levodopa-induced dyskinesia. No cognitive decline or dysautonomic features have emerged during more than 5 years of follow-up. Both patients presented with a severe striatal binding defect in dopamine transporter SPECT imaging. Conclusions: The results of this observational study add evidence to the suggestion that the p.A53E mutation in SNCA is indeed pathogenic and results in autosomal dominant PD. Bradykinesia and early onset of levodopa-induced dyskinesia are the characteristic clinical features associated with the A53E mutation, but the patients did not exhibit dementia or dysautonomia. The [123I]FP-CIT SPECT findings indicated a profound, symmetric dopaminergic defect, in contrast to those observed in patients with idiopathic PD. The A53T mutation in SNCA, encoding α-synuclein, was the first human gene mutation reported to cause Parkinson disease (PD).1 However, only 5 additional SNCA point mutations associated with PD, parkinsonism, or dementia with Lewy bodies have been reported since: A30P,2 E46K,3 H50Q,4,5 G51D,6,7 and, recently, A53E in a 1-patient postmortem study.8 We describe a Finnish family, unrelated to those previously reported, with PD in 3 successive generations in which the c.158C>A, p.A53E (A53E) SNCA mutation was detected. The index patient (patient B2-1) was a 47-year-old woman, and patient B3-1 was her 29-year-old daughter (figure 1). Both were investigated and followed at the neurology outpatient clinic of Turku University Hospital. The father of patient B2-1 was diagnosed with PD at age 52 and died at age 63. No autopsy was performed, and no further clinical details were available. The index patient is patient B2-1. The father of the index patient was diagnosed with Parkinson disease at the age of 52 years. The clinically affected daughter of the index patient is patient B3-1. Patient B2-1 presented at age 42 with intermittent numbness in the right arm and leg and fluctuating dysarthria. The initial clinical examination was normal. Three months later, mild bradykinesia without resting tremor, mild dysarthria, and hypomimia were observed. She reported several years of constipation. She did not have hyposmia and reported no sleep disturbances. Four months later, she was diagnosed with PD. Two years later, she developed mild parkinsonian posture with symmetric rigidity of the upper extremities. Response to levodopa medication was good, with particularly clear benefit for bradykinesia. However, she developed motor fluctuations 1 year after levodopa initiation (3 years after presentation). Dyskinesia was most pronounced in the upper limbs and upper body even at very low doses of levodopa. Limb rigidity was mildly pronounced in the right-side extremities (right: grade 2, left: grade 1); eye movements were intact. There were no dysautonomic symptoms. Neuropsychological testing at the age of 45 years revealed no cognitive abnormalities. Four years after presentation, the Unified Parkinson's Disease Rating Scale motor (part III) off score was 31 and the on score was 8 with troublesome peak-dose dyskinesias. 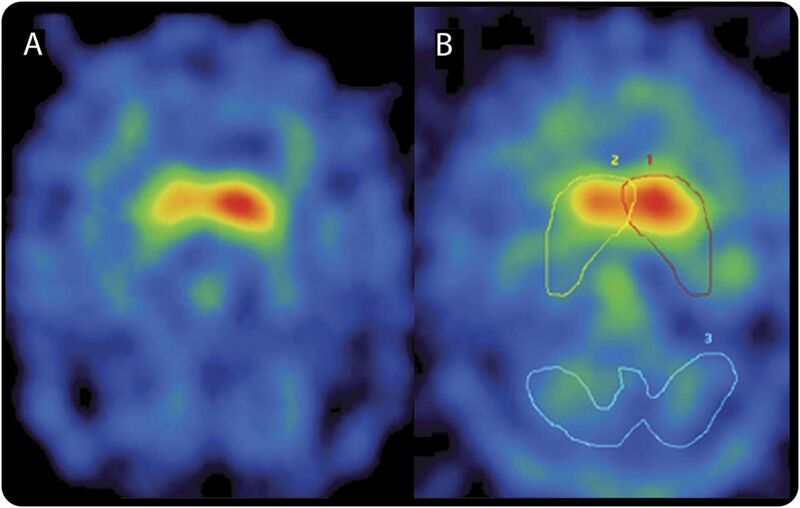 Because of the motor fluctuations, 5 years after presentation, the patient received treatment with bilateral subthalamic nucleus deep brain stimulation (STN-DBS) that reduced fluctuations and increased on time. Brain MRI was normal. [123I]FP-CIT SPECT imaging 4 months after presentation revealed clearly decreased dopamine transporter (DAT) binding bilaterally in the posterior putamen and right caudate (figure 2A). The specific binding ratios (SBRs) were 0.59 in the right posterior putamen and 0.59 in the left, and 1.66 in the right caudate nucleus and 2.15 in the left. Transaxial planes of [123I]FP-CIT SPECT on the striatal level are presented for 2 patients with Parkinson disease harboring the A53E mutation in SNCA. (A) Patient B2-1 at age 42. (B) Patient B3-1 at age 25. Striatal and (for reference) occipital regions of interest are shown. Note the bilaterally decreased uptake that is more pronounced in the putamen and less so in the caudate, with some loss in the right caudate of both patients. Patient B3-1 presented at age 25 with gait disturbance and left-hand clumsiness. She had a history of panic disorder and depression at the age of 14 years. The initial clinical examination revealed mild bradykinesia and mild rigidity of the left arm. Moreover, she had spastic gait, and lower-limb reflexes were pathologically brisk. She was diagnosed with PD 6 months after presentation. Mild resting tremor in the left arm and intermittent head tremor were noted 10 months after presentation. After insufficient response to monoamine oxidase B inhibitors and pramipexole, low-dose levodopa was initiated 12 months after presentation with an excellent response. However, at 15 months after the first presentation, the patient developed dyskinesias that were most pronounced in the upper limbs and upper body. After 4 years of follow-up, dyskinesias were prominent even with a very low daily levodopa dose (100 mg). Amantadine did not reduce dyskinesias. During 5 years of follow-up, she did not develop any cognitive symptoms. She is currently under consideration for STN-DBS. MRI of the brain and cervical and thoracic spinal cord was normal. [123I]FP-CIT SPECT 1 month after presentation revealed decreased activity bilaterally in the putamen and right caudate (figure 2B). SBRs were 0.54 in the right posterior putamen and 0.51 in the left, and 1.64 in the right caudate and 2.16 in the left. Because the family had PD with an autosomal dominant inheritance pattern, analyses of the LRRK2 gene (GenBank NM_198578.3, NC_000012.11) exons 24, 25, 27, 29, 31, 35, 41, and 44, and the complete coding region as well as the flanking intronic regions of the SNCA gene (GenBank NM_000345.3, NM_001146054.1, NC_000004.11) were performed. Analysis of the LRRK2 gene revealed no pathogenic mutations, whereas analysis of the SNCA gene revealed a heterozygous c.158C>A, p.A53E (A53E) alteration in both patients. Because the A53E variant had been reported in only one other unrelated Finnish family with parkinsonism, next-generation sequencing of 73 genes associated with PD or parkinsonism (Medical Neurogenetics, Atlanta, GA) was performed to further elucidate the significance of the A53E variant. In patient B2-1, no further pathogenic mutations were detected. In patient B3-1, in addition to the A53E change, a novel heterozygous KIF5A variant (c.611G>C, p.R204P) was detected. All investigations and clinical work described in this manuscript were performed in accordance with the ethical guidelines issued by our institution for clinical studies as well as the Declaration of Helsinki. Written informed consent was obtained from all patients. 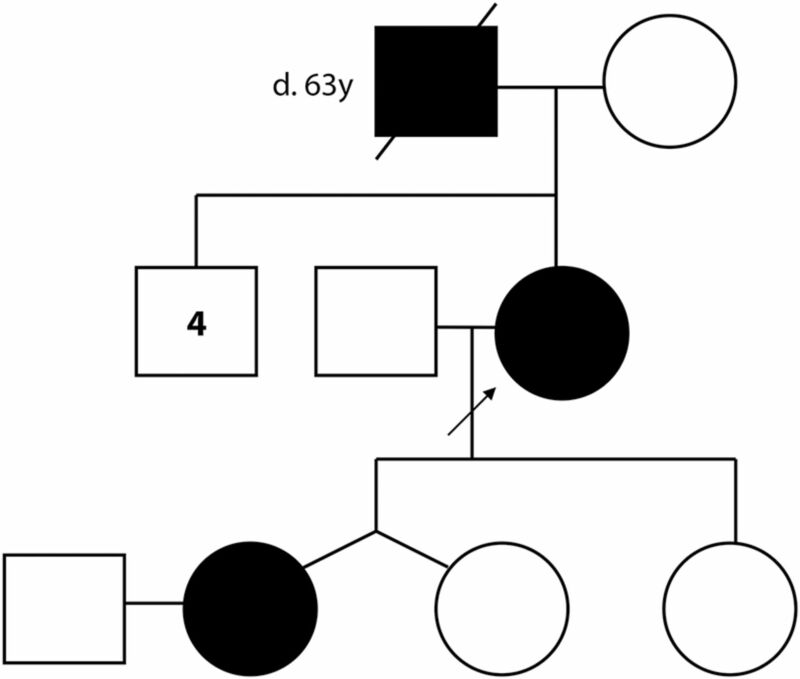 We report a Finnish family with autosomal dominant PD harboring the A53E mutation in SNCA. Both patients exhibited prominent bradykinesia but little tremor and early onset of levodopa-induced dyskinesia even at low doses of levodopa. No cognitive decline or dysautonomia was observed after 4–5 years of follow-up, whereas these features have been reported in association with other pathogenic SNCA mutations. The features of all reported patients with the A53E mutation are summarized in the table. In addition to the A53E mutation, a heterozygous KIF5A variant p.R204P was detected in patient B3-1 but not in patient B2-1. This variant has not been reported as a polymorphism, and the amino acid is evolutionarily conserved. This change is categorized as deleterious or probably damaging by SIFT and PolyPhen-2 algorithms. Furthermore, the p.R204Q KIF5A mutation is associated with spastic paraplegia 10.10 We suggest that the corticospinal tract signs observed in patient B3-1 (but absent in patient B2-1) were due to the KIF5A variant detected in this patient. The bilateral dopaminergic defect in posterior putamen detected by DAT SPECT was profound and symmetric.11 The level and regional distribution of dopaminergic degeneration differed notably from the typical findings in patients with early idiopathic PD (asymmetric binding defect in the contralateral posterior putamen). Furthermore, the striatal tracer binding was nearly identical between patients B2-1 and B3-1, suggesting that the presynaptic DAT binding is determined by the mutation. The A53E mutation in SNCA results in autosomal dominant, hypokinetic-rigid PD with early-onset, prominent levodopa-induced dyskinesia but without dementia. SPECT imaging findings suggest that the striatal dopaminergic defect in bilateral posterior putamen is profound and symmetric early in the disease with this mutation. Dr. Martikainen: study design, drafting the manuscript, acquisition and interpretation of data, reviewing the manuscript for intellectual content. Dr. Päivärinta and Dr. Hietala: acquisition and interpretation of data, reviewing the manuscript for intellectual content. Dr. Kaasinen: study design, acquisition and interpretation of data, reviewing the manuscript for intellectual content. Dr. Martikainen, Dr. Päivärinta, Dr. Hietala, and Dr. Kaasinen report no disclosures. Go to Neurology.org/ng for full disclosure forms. Funding information and disclosures are provided at the end of the article. Go to Neurology.org/ng for full disclosure forms. The Article Processing Charge was paid by the Turku University Hospital Division of Clinical Neurosciences, Turku, Finland. Accepted in final form September 6, 2015.
. Ala30Pro mutation in the gene encoding alpha-synuclein in Parkinson's disease. Nat Genet 1998;18:106–108.
. The new mutation, E46K, of alpha-synuclein causes Parkinson and Lewy body dementia. Ann Neurol 2004;55:164–173.
. A novel α-synuclein missense mutation in Parkinson disease. Neurology 2013;80:1062–1064.
. Alpha-synuclein p.H50Q, a novel pathogenic mutation for Parkinson's disease. Mov Disord 2013;28:811–813.
. G51D α-synuclein mutation causes a novel parkinsonian-pyramidal syndrome. Ann Neurol 2013;73:459–471.
. α-Synucleinopathy associated with G51D SNCA mutation: a link between Parkinson's disease and multiple system atrophy? Acta Neuropathol 2013;125:753–769.
. Novel α-synuclein mutation A53E associated with atypical multiple system atrophy and Parkinson's disease-type pathology. Neurobiol Aging 2014;35:2180. e1–e5.
. The newly discovered Parkinson's disease associated Finnish mutation (A53E) attenuates α-synuclein aggregation and membrane binding. Biochemistry 2014;53:6419–6421.
. Complicated forms of autosomal dominant hereditary spastic paraplegia are frequent in SPG10. Hum Mutat 2009;30:E376–E385.
. Novel SNCA mutation causes autosomal dominant Parkinson's disease [abstract]. Mov Disord 2014;29(suppl 1):153.